For the last seventy-four years college students, both undergraduate and graduate, were taught Keynesian economics in their Macroeconomics courses. I was one of them. The works of von Mises, Hayek, and Hazlitt were never mentioned. Many professors, even today, do not know who they were. Unfortunately the Keynesian cult is alive and well in the economics profession and in the White House. One only wonders why any one would still take Keynes or Keynesian economists seriously. Apparently ideology trumps logical thinking, knowledge of economic history, the history of economic thought and common sense. Barack Obama’s Favorite Economist–John Maynard Keynes–A Great Guy? 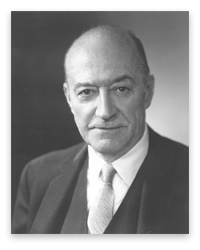 Hunter Lewis dedicated his book to Henry Hazlitt and recommended especially his books, The Failure of the “New Economics” and Economics in One Lesson. I could not agree more with his recommendations. “Henry Hazlitt did the seemingly impossible, something that was and is a magnificent service to all people everywhere. He wrote a line-by-line commentary and refutation of one of the most destructive, fallacious, and convoluted books of the century. The target here is John Maynard Keynes’s General Theory, the book that appeared in 1936 and swept all before it. In economic science, Keynes changed everything. He supposedly demonstrated that prices don’t work, that private investment is unstable, that sound money is intolerable, and that government was needed to shore up the system and save it. It was simply astonishing how economists the world over put up with this, but it happened. He converted a whole generation in the late period of the Great Depression. By the 1950s, almost everyone was Keynesian. But Hazlitt, the nation’s economics teacher, would have none of it. And he did the hard work of actually going through the book to evaluate its logic according to Austrian-style logical reasoning. The result: a 500-page masterpiece of exposition. Murray Rothbard was blown away. Keynes’ General Theory is here riddled chapter by chapter, line by line, with due account taken of the latest theoretical developments. The complete refutation of a vast network of fallacy can only be accomplished by someone thoroughly grounded in a sound positive theory. Henry Hazlitt has that groundwork.An “Austrian” follower of Ludwig von Mises, he is uniquely qualified for this task, and performs it surpassingly well. 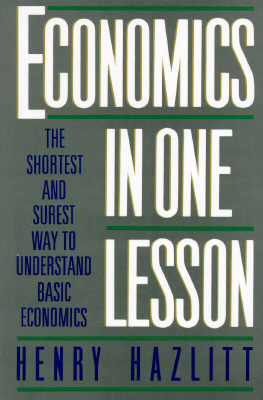 It is no exaggeration to say that this is by far the best book on economics published since Mises’ great Human Action in 1949. Mises’ work set forth the completed structure of the modern “Austrian” theory. Hazlitt’s fine critique of Keynes, based on these principles, is a worthy complement to Human Action. 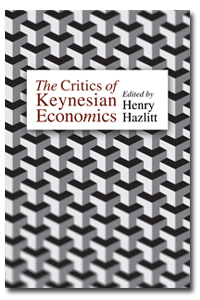 Henry Hazlitt, a renowned economic journalist, is a better economist than a whole host of sterile academicians, and, in contrast to many of them, he is distinguished by courage: the courage to remain am “Austrian” in the teeth of the Keynesian holocaust, alongside Mises and F. A. Hayek. On its merits, this book should conquer the economics profession as rapidly as did Keynes. But whether the currently fashionable economists read and digest this book or not is, in the long run, immaterial; it will be read, and it will destroy the Keynesian System. At the very least, there is now a new generation under thirty-five, to bring this message to fruition. Far from being a dull read, this book has all the brightness and clarity we’ve come to expect from Hazlitt. He is a dazzling writer, and one can’t be thrill to see him in the ring with the giant Keynes. By the time he delivers the knock-out punch–taking on Keynes’s suggestion that we nationalize investment–there is nothing left of his opponent. Epstein and Taylor: Are we all Keynesians now? “…While at Newsweek, Hazlitt wrote Economics in One Lesson, which has sold nearly one million copies and is available in at least ten languages. Hazlitt argued that government intervention focuses on the consequences that are seen and ignores those that are not. The latter include wealth not created and even destroyed by regulation, inflation, and taxation. In 1947, he wrote Will Dollars Save the World?, a book attacking the Marshall Plan, which he saw as an international welfare scheme. The subsequent history of U.S. foreign aid shows just how right he was. In 1950, Hazlitt became editor, along with John Chamberlain, of the fortnightly magazine, the Freeman; some of his best articles published there were later collected into The Wisdom of Henry Hazlitt. Also as a prophet, Hazlitt wrote The Great Idea (reprinted a year later as Time Will Run Back), a novel showing how a country can move from socialism to market economics at a time when most people thought socialism was the unstoppable wave of the future. 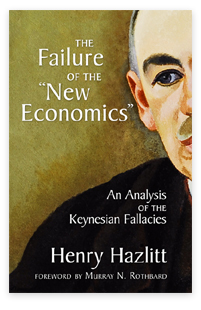 “…Henry Hazlitt confronted the rise of Keynesianism in his day and put together an intellectual arsenal: the most brilliant economists of the time showing what is wrong with the system, in great detail with great rigor. With excerpts from books and articles published between the 30s and 50s, it remains the most powerful anti-Keynesian collection ever assembled. Murray Rothbard Where Did The Free Markets Go? Turning Japanese – Is the US Creating Its Own Lost Decade? “…Hunter Lewis was born in Dayton, Ohio, USA, in 1947 and graduated from the Groton School and Harvard University (AB 1969). After working at the Boston Company, then one of the largest investment managers, first as assistant to the president and then vice-president, in 1975 Lewis co-founded and served as co-chief executive and then chief executive of Cambridge Associates LLC, an investment advisor to research universities and colleges representing over three-quarters of U.S. higher education endowment assets, foundations, cultural organizations, international organizations and other non-profit institutions as well as families. Lewis was a co-inventor of what became known as the American University style of institutional investing, which gave American university endowment funds the highest investment returns in the world among institutional investors, and which became widely emulated. In addition to his work at Cambridge Associates, Lewis has served as treasurer and president of the American School of Classical Studies at Athens, a graduate research institute affiliated with 150 American colleges and universities, president of the Alliance for Natural Health-USA, chairman of the National Environmental Trust, chairman of Dumbarton Oaks (affiliate of Harvard University), founder and chairman of the Trearne Foundation, which provides educational assistance to foster children, chairman of the Worldwatch Institute, chairman of Shelburne Farms, treasurer of the World Wildlife Fund (World Wide Fund for Nature), trustee of World Wildlife Fund International, member of the Advisory Board of Environmental Health Sciences, trustee of the Morgan Library, trustee of the Rockefeller Brothers Fund, trustee of the Thomas Jefferson Foundation (Monticello), trustee of the Peabody School, trustee of the Groton School, trustee of the Core Knowledge Foundation, and member of the World Bank Pension Finance Committee. Lewis has contributed to many newspapers and periodicals including the New York Times, The Times, the Washington Post, and the Atlantic Monthly as well as numerous websites such as Forbes.com. 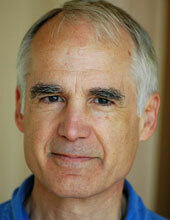 He also is an author and editor of books on economics and moral philosophy. 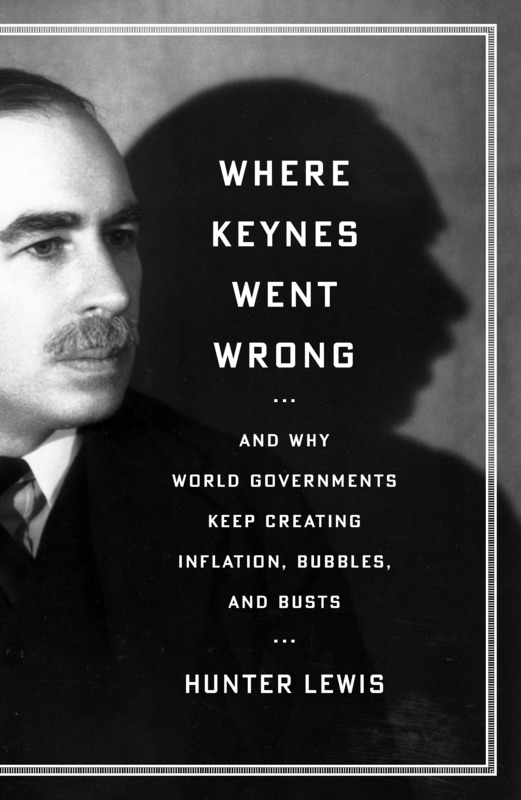 His works include: Where Keynes Went Wrong: And Why World Governments Keep Creating Inflation, Bubbles, and Busts (Axios Press; September 25, 2009), Are the Rich Necessary? : Great Economic Arguments and How They Reflect Our Personal Values (Axios Press; September 25, 2007; Rev Updated PB edition October 30, 2009), A Question of Values : Six Ways We Make the Personal Choices That Shape Our Lives (Harper, Collins; 1990, Axios Press; Rev Updated edition May 25, 2000), The Beguiling Serpent (Axios Press; August 31, 2000), Alternative Values: For and Against Wealth, Power, Fame, Praise, Glory, and Physical Pleasure (Axios Press; July 25, 2005) and The Real World War (Coward, McCann & Geoghegan/Putnam; 1982). The Coming Inflation and A New Money Supply Backed By Real Estate?–Free Enterprise To The Rescue? M3 Money Meteorite Moves–Deep Impact–The Coming Inflation Tidal Wave–Wage and Price Controls Will Signal Radical Socialist Obama’s Failure! The Obama Depression Has Arrived: 15,000,000 to 25,000,000 Unemployed Americans–Stimulus Package and Bailouts A Failure–400,000 Leave Labor Force In July! The 12 Trillion–$12,000,000,000,000 Crime of The Century: The Decline and Fall of United States of America By Radical Socialist Spending–Look Before You Leap! Federal Government Extortion Of Sound Banks–You Decide?–Take This TARP and Shove It! The Obama Depression Continues–Official Unemployment Hits Rate 9.8% (15,142,000 Seek Full Time Job) and Real Unemployment Rate Hits 17.0% (26,181,000 Seek Full Time Job)! United States Economic Depressions–The Good, The Bad, and The Ugly–Obama’s Depression–Over 15,000,000 Americans Seek Full Time Job! The Triumph of Capitalism and The Power of Consumer Sovereignty Over Massive Government Failure–Bankruptcy of General Motors–Now Government Motors! Rose Colored Glasses:The Economy Is Recovering–Where Are The Jobs? When Will Inflation Hit? 2012–Election Year! American Citizens Want Jobs and Criminal Alien Removal, Not Criminal Alien Census and Health Care! President Barack Obama Beats It–President Franklin Roosevelt Record–Worse Unemployment Numbers Since 1933–14,700,000 Unemployed Americans Greater than 13,000,000 in 1933! The Obama Depression (OD) Starts July 4, 2009–30 Million Americans March To Tea Parties In Washington D.C. and Over 1,000 Cities and Towns Across America!